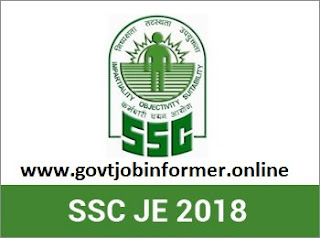 SSC JE 2017: SSC Junior Engineer Exam is a national level test conducted by Staff Selection Commission for the recruitment of Junior Engineer for Civil, Mechanical and Electrical trade. If you are going to apply for this examination, you can find all the necessary details for SSC JE 2017 Examination. The exam is divided into two stages namely Part-1 & Part-2. Candidates who qualify Paper-1 will be eligible for appearing in Paper-2. Short listing will be done according to the performance of the candidates in Paper-1 and Paper-2. The final Result will be announced in the month of March/April 2018. Tibetan refugee came to India before 1st January 1962 to become a permanent resident. A person of Indian origin migrated from Burma, East African countries of Kenya, the United Republic of Tanzania, Malawi, Ethiopia, Sri Lanka, Uganda, Zambia, Zaire and Vietnam to become a permanent resident of India. Junior Engineer (Civil), CPWD – B.E. / B.Tech. / Diploma in Civil Engineering from a recognized University/Institute. Junior Engineer (Electrical), CPWD – B.E. / B.Tech. / Diploma in Electrical Engineering from a recognized University/Institute. Junior Engineer (Civil), Department of Posts – B.E. / B.Tech. / 3 years Diploma in Civil engineering from a recognized University/Institute. Junior Engineer (Electrical), Department of Posts- B.E. / B.Tech. / 3 years Diploma in Electrical engineering from a recognized University/Institute. For the post of Junior Engineer (Civil and Electrical), Department of Post and Junior Engineer (Surveying and contract), MES candidate’s age should be between 18 to 27 years. For the post of Junior Engineer (Civil, Electrical & Mechanical), MES candidate’s age should not exceed 30 years. The application fee of Rs. 100/- has to be paid either online or offline mode (application fee for women, ex-servicemen and other reserved categories are exempted). The candidates can apply online from the website www.ssconline.nic.in or www.ssconline2.gov.in. They have to fill all the required details in the application form and upload the scanned images of their photograph & signature. The scanned photograph must be of 8 bit and in jpg format. The size of the photograph should be between 4 kb to 12 kb and the resolution should be 100/120 pixels. The scanned signature image should be of 8 bit and in jpg format. The size of the signature should be between 1 kb to 12 kb and the resolution should be 140/60 pixels. To complete the application process the candidates have to pay the application fee.There will be 2 parts in the application process. The candidates who have filled part 1 and paid the application fee will be able to proceed with part 2. The candidates can pay the fee either online or offline (through e-challan). SSC Junior Engineer Exam will be completed in 2 stages- written test of 500 marks. There will be a penalty of ¼ marks for each wrong answer. According to the examination pattern of SSC JE 2016, the appearing candidates for the post of JE (civil), JE (quantity surveying & contract) should attempt Part A (civil & structural) of paper I & II. On the other hand appearing candidates for JE (Electrical) need to attempt Part B (Electrical) & the candidates appearing for JE (Mechanical) s=have to attempt Part C (mechanical) of Paper I & II. Computer Based Test (CBT) will be organized for Paper-I. The Paper-I of SSC JE will be of Objective type. Applicants who are shortlisted on the basis of performance in Paper-I will be called for Paper –II. The paper second will carry total 300 marks. On the basis of the marks obtained by the aspirants in both Paper-I and Paper-II, the Final assortment of applicants will be confirmed. Provision to the departments will be completed on the basis of merit. The preferences of the posts entered by the candidates will also be given due prominence. JE (civil & mechanical) in Central Water Commission (CWC) and Farakka Barrage. The admit card for the examination will be available from 10-15 days before the examination at the official website of the commission. To download the admit cards, the applicants have to enter their Registration ID/Roll No./DOB. They can take the printout of their admit card to write the examination. The SSC is going to organize junior engineer examination. here you can find the expected cut off marks and also can check previous year cut off. The applicants who will appear in SSC JE Exam 2017 can now check the answer key and cut offs of the examination. Go through the complete exam syllabus. Analysis important chapters and topics and write down impotent points and topics. Keep clearing all your doubts with your friends or teachers in time. Before you start your preparation for SSC Junior Engineer exam, get the appropriate study materials. You can get books as per latest syllabus, online study notes, and other study materials. Try to come up with methods to solve questions faster so you wouldn’t be wasting a lot of time during the exam. Daily update yourself with the latest current affairs and general knowledge. This will help you in the exam. Do practice with online test series that is easily available on any coaching website. You need to score a minimum score to secure the cut-off marks. Take last 5 years question paper and note the important questions, repeated questions, and pattern. Memorize all the important formulas and short tricks for the questions.